It's a rebadged Netgear wireless router, but is it any good? The Super Hub 2ac does the job and does it fairly well. Given that this is the standard Virgin Media router all new (and some existing) customers will get, it manages to deliver the goods without much trouble. Virgin Media has been upgrading its user speeds (and cost of services) almost on a yearly basis. It also regularly updates the router shipped to new customers (and existing savvy customers who might look for a new one) but, as is the case with most vendor-sourced routers – like the BT Home Hub 5 or TalkTalk Super Router – you won't be able to buy one as it remains the property of the service provider for the entire duration of the contract. So meet the Super Hub 2ac, a rebadged Netgear wireless router, the biggest claim to fame of which is its maximum theoretical download speed of 1.3Gbps, achieved thanks to the 802.11ac protocol. 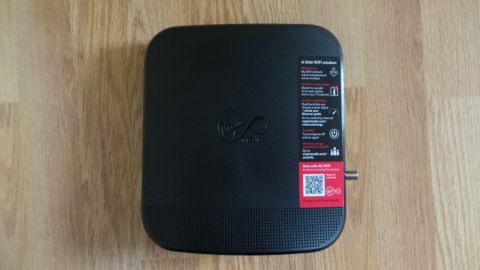 The device has been drip-fed to select Virgin Media customers for at least six months and your best bet, should you want to grab one as a Virgin Media customer, would be to give them a call. The Super Hub 2ac looks almost identical to the Super Hub it replaces. It stands vertically as a black monolith (you can't wall mount it) with four Gigabit Ethernet ports at the back (the USB port is inactive) and a power button. You won't be able to connect any peripheral or storage device to it unfortunately. A WPS button is located at the front with LED status lights to indicate 2.4GHz and 5GHz Wi-Fi activity, network traffic, cable connection and power. Flip the router over and you find a sticker with default SSIDs and passwords for the two radios along with other security details. Connecting to the Super Hub 2ac is a straightforward process – you will need to activate your line again, a step that is clearly explained in the self-install package that accompanied my router. I also checked that the firmware was the latest one (v1.01.11). You can use both radios at the same time, and with a combined five internal antennas (two for 2.4GHz, and three for 5GHz), the router offers a maximum theoretical transfer rate of 1300Mbps. Accessing the control panel of the Super Hub 2ac provides you with a fairly basic set of features. You can disable wireless functionality (using it as a modem only), tweak the security mode, change the SSID and the password, tinker with the channel settings, as well as altering port characteristics and filter down to IP/MAC address. You can also set up your own DMZ address as well as adding two guest networks per wireless channel (so four in all) and locally administered MAC addresses. Virgin Media did a great job of providing all the necessary information in a well-packaged box. You can even reuse the latter to send your old router (remember it is a leased one) back to them when you're done. Measuring the performance of such a device is a bit of a red herring given that: (a) your download speeds will depend on a bewildering array of variables; (b) only Virgin Media broadband users will be able to get the Super Hub 2ac; (c) a router is unlikely to be the crucial deciding point between competing broadband services; (d) you can always use it as a modem and use an external router if that fits your needs better. Just bear in mind that up to 20 concurrent Wi-Fi devices can be connected to the hub before experiencing a marked deterioration in your user experience according to Virgin Media, although your mileage will of course vary. That said, if all you want to do is surf, the Super Hub 2ac is fast enough based on my anecdotal testing. I did reach speeds in excess of 150Mbps when testing the device via Speedtest.net (I sat next to the router). My line speed is rated at 152Mbps. I didn't connect the device to a NAS or any storage devices to carry out file transfer tests, nor did I overload the hub with multiple devices running concurrently. Virgin Media's router is simple to install, so much so that the company offers it as a quick-start, self-install option which works well if you're an existing customer. The device itself is a bit of a let-down but that's to be expected – after all, the company is not expected to provide customers with a first-class router with bells and whistles. Instead, they went for a just-good-enough option, the one chosen by the rest of the competition (TalkTalk, Sky, Plusnet, BT, etc). Like all branded routers, you can't buy the Super Hub 2ac (where would you use it anyway?) and if you are not happy with its performance, you can always get a cheap wireless router to supplement it.